The case of a Norwegian newspaper editor, who was suspended from travelling to Russia by the shadowy Federal Security Service, is finally slated to reach a court in Moscow, shrouded in secrecy. The case of a Norwegian newspaper editor, who was suspended from traveling to Russia by the shadowy Federal Security Service, is finally slated to reach a court in Moscow, shrouded in secrecy. In March, Thomas Nilsen, a past member of Bellona’s Russia group who now edits the bilingual online Independent Barents Observer news portal in Kirkenes, Norway, was told at a border crossing he was no longer allowed to enter Russia, as he posed a security risk. Days later, he found out his name had been added to a stop list of undesirable individuals, and he was told he wouldn’t be allowed into the country for five years – in apparent retaliation for EU and Norwegian blocks on travel for specific Russians. At the time, Nilsen challenged the vague FSB decision in court. Now, after 11 months of indolent progress though lower courts, his portal reports that his case is due to be heard in the Moscow City Court – a longtime refuge of spy cases pregnant with secrets, veiled charges, and unmentionable decisions. As in March, Nilsen, who has spent the last three decades traveling without incident to and from Russia for civil society purposes, says he has been targeted for nothing more than making his news portal available in both English and Russian. “The challenge with the Barents Observer isn’t at all about the articles we write, but that we publish in Russian for a Russian audience,” he said via Skype on Thursday, adding that the portal puts special emphasis on the voice of civil society groups. “When the FSB says I am a threat to Russia, they would to better to say that free journalism is a threat to the FSB’s understanding of security,” he said. Of course, he won’t be allowed into Russia to speak in his own defense. Ivan Pavlov, a noted Russian human rights lawyer who is representing Nilsen’s case, intends to argue that keeping Nilsen out of Russia is a violation of the constitution, and that the travel ban is based on a decision by an agency that doesn’t have the authority to make it. In a Facebook posting earlier this week, Pavlov said to expect FSB lawyers to deploy all manner of subterfuge, from arguing not even publicize why it rejected Nilsen’s travel to Russia, to saying that decision was based on some law or regulation which is itself a secret. It is still unclear when, exactly, the case will be heard by the Moscow City Court. Previous to this, the case has staggered its way through the city court of Petrozavodsk, in the Republic of Karelia, where the FSB division responsible for the border guards who turned Nilsen away is based. That court, however, refused to hear it, and it was forwarded to the Pechenga Court in Zapolyarny near Murmansk. The judge there, according to Nilsen’s portal, refused to say the decision to keep Nilsen out of Russia was not legal. Nothing about this convoluted path is at all new to Nilsen. During his tenure with Bellona, he was deeply involved in the defense of Alexander Nikitin, the Bellona expert from Russia who in 1995 was charged with treason for his contributions to the organization’s report on radioactive waste handling in the Russian Navy. Russia’s Supreme Court acquitted Nikitin in 2000, but Nilsen and other Bellona staff who co-authored the report were targeted with visa rejections while they worked on Nikitin’s defense in 1996. 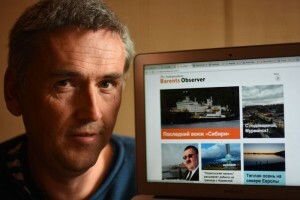 Since departing Bellona, Nilsen has edited the Independent Barents Observer, which became the focus of a backstairs flap between the Norwegian government and the FSB. The Norwegian officials overseeing the paper pressured Nilsen and his staff to dull their editorial edge. Nilsen refused. He and his staff reopened the paper and placed its ownership in the hands of its journalists. Later, state broadcaster NRK carried a report citing an anonymous official who said the FSB had pressured those Norwegian officials to gag the paper. The outlet covers issues of cross border cooperation between Norway and Russia, and its reporting has often raised hackles on both sides of the divide. Nilsen has also aggressively covered issues of pollution wafting into Norway from Russian industry on the Kola Peninsula, as well as the ongoing drama surrounding nuclear waste produced by the Russian Navy’s Northern Fleet. Nilsen’s rejection at the Russian border has sent chills through the Norwegian and Russian NGO community, which is already walking on eggshells after Bellona’s Russia offices were targeted as “foreign agents” and stopped functioning as non-profits earlier this year. Nils Bøhmer, Bellona’s general manager and Nilsen’s old comrade from the days of battling Nikitin’s case, said it was important that the Russian judicial system run the case out.